I woke up, and it was still dark. Dang. I thought that maybe I was experiencing a jet-lag moment. But I wasn't. My ankles and legs were itching and displayed the all too familiar little red bites. The day before, I had forgotten one my basic rules and now I was paying the price. One of my reasons to wander is to explore natural environments. I like using my long background in ecology, biology, and environmental sciences. My career and personal history allows me to see the trees in the forest and the forest from the trees. Also, I just like being outdoors. I’m on walkabout in Taipei, Taiwan. While staying in Taipei, I found four different local and accessible ways to commune with Taiwan natural environments. 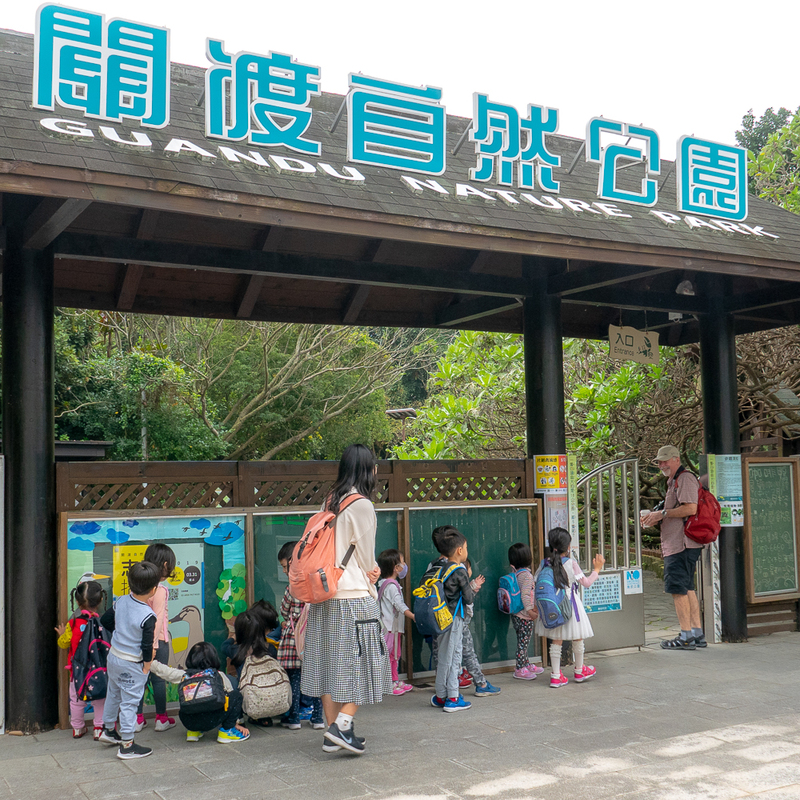 My trusted travel partner and I are getting out and about using public transportation, and of course on foot, to Daan Park, Guandu Nature Park, the Taipei Botanical Garden, and the Yangmingsham National Park. Rather than running from one area to another, we kept a schedule of only one natural area per day. Rushing through a park, even if you see remarkable things, can ruin a day. We slow down to ‘smell the roses’, take photographs, and look for birds. Manhole covers all over Taipei remind people that the water under foot is used by wildlife. Stepping out of the metro station at Daan Park, we can see the famous Taipei 101 on the horizon. The metro station features a new shaded and cool (not blazing hot) underground garden. In the park we walked the meandering dirt pathways, past playgrounds, mature trees, newly planted trees and several wet areas full of birds, turtles, and and a shy fish or two. I was very excited to see a dawn redwood, a deciduous redwood native to China. I don’t get it. What is he photographing? Daan Park was close to our Airbnb, easy to access, and it is a place where ordinary people do their everyday ordinary things. I don’t think it qualified as a ‘tourist attraction,’ but it is in the guidebooks as a good place for some urban quiet time. It was fun to watch a gaggle of 15 to 20 male photographers with their big Canon lenses and tripods, photograph the egrets, grey herons and night herons hanging out in the park. What we consider common birds in Washington State were a day in the park for these gentlemen. The Daan Metro Station on a beautiful day. We didn’t see many flowers in bloom, but the foliage still made a good show. The park was busy with people walking their dogs, jogging, taking the kids out to the playground, and enjoying a lovely day. Its the normal kind of stuff we would find in Olympia, Washington, but we were on the other side of the planet. I like seeing that we all have so much in common, like a day in the park with our family. In the middle of the busy urban landscape of Taipei, Taiwan, Guandu Nature Park sits as a natural wetlands with easy access. Facilities include displays, an auditorium, conference room, exhibits, an information desk, a classroom, a cafe, and a gift shop. A panoramic view of Taiwanese wetlands from the Guandu Nature Park Visitor Center. I remember learning about mud-skippers in biology class, the this is the first time I have seen one in-situ. I always like to see school groups at nature areas. This may be a Common Kingfisher, but getting a shot like this is not common for me. 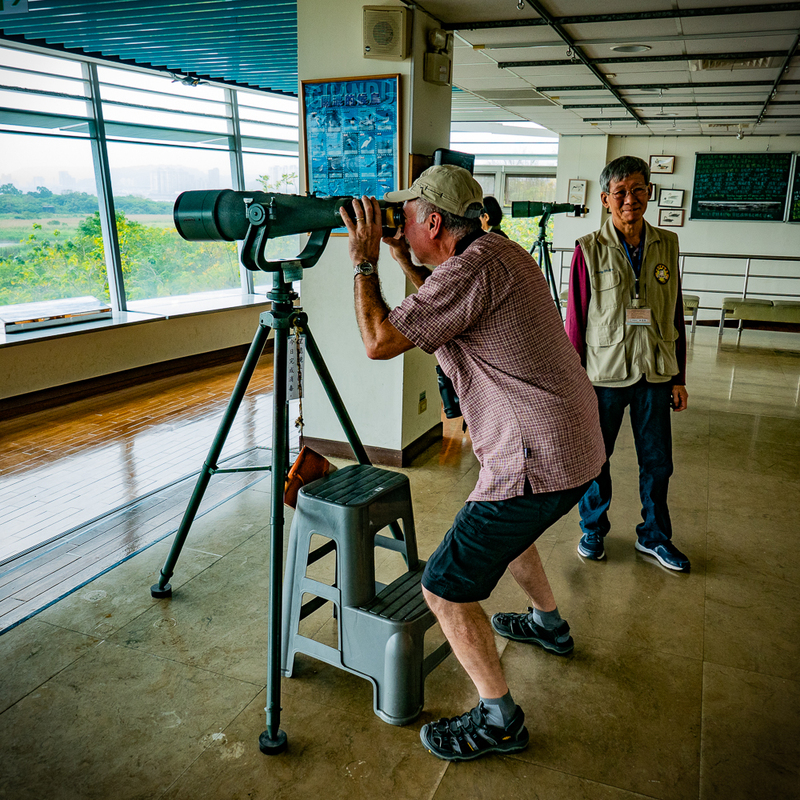 With the help of the docent, Keith takes a look through the largest binoculars I have ever seen. We are not accustomed to the heat and after walking the trails, we hang out in the visitor center and get a fruit smoothy from the cafe. The docent was very helpful in sharing the biggest binoculars in the world. I sat for a while and photographed a common kingfisher who was quite happy just perching on a stick, diving for fish, then returning to the same spot where he started. Even my son enjoyed strolling through the Taipei Botanical Garden. Patrick and Keith pose for me at the botanical garden in Taipei. The Taipei Botanical Garden was first built in 1896 and the landscape is mature and rich. It contains several exhibit and cultural areas that are managed by the Taiwan Forestry Research Institute. It is also an archaeological relic with 4,500 years of habitation. Even though all the vegetation in botanical gardens is planted, the area still has an abundance of native plant life and it becomes a part of the local environment. Birds are plentiful, and photography of foliage and flowers is readily accessible. The Taipei Botanical garden is also home to a conversation organization which is working to ensure world-wide conservation of threatened plants, the continued existence of which are intrinsically linked to global issues including poverty, human well-being and climate change. I liked the mature gymnosperms and the Plants in Literature area that featured plants and plant names associated with the twelve signs of the Chinese zodiac. I wanted a quite day in to stay in and blog. 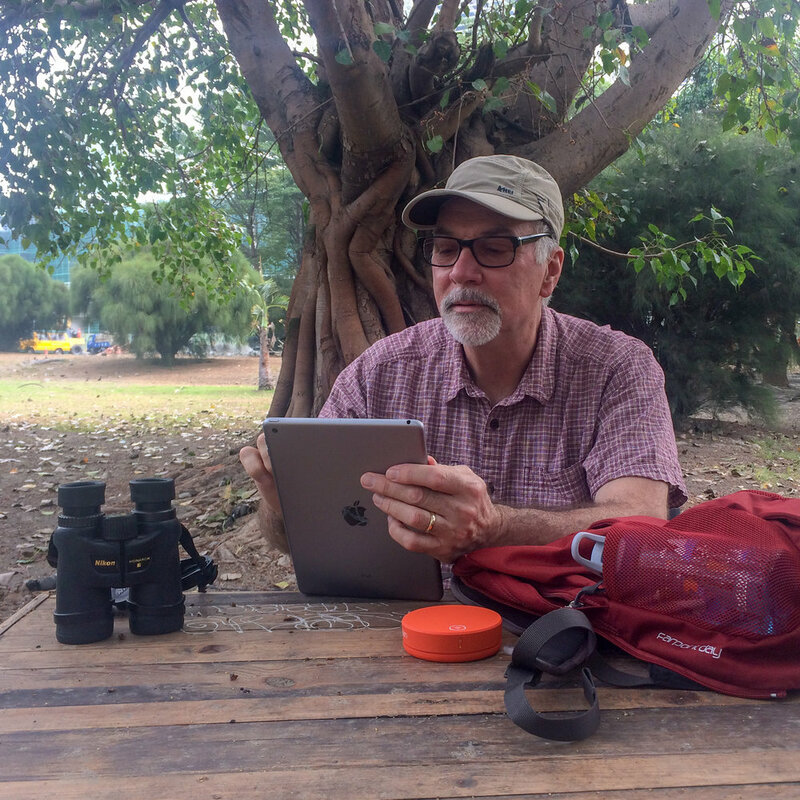 My favorite traveling birder companion (a.k.a my husband) was eager to get his daily “life bird” so he headed out to Yangmingshan National Park. My favorite birder counting his accomplishments. Keith accessed this National Park by taking a metro train, then a public bus. I don’t think I have ever used public transportation to get to an American National Park. The Park Headquarters had very nice maps in English and the staff also spoke English and were very helpful. They warned him to avoid one of the trails on the map because the cows in the fields were chasing and attacking hikers. It is always good to know your trail hazards. There were many hikers along the trail that sang out a cherry “hello” in English and Chinese. Keith hiked three trails, each about two miles long and all were well signed, maintained and enjoyable for an afternoon’s hike. He was also happy to see several bird species that he had never seen before. A waterfall in Yangmingshan National Park. Watch out for not just any owl, but a Scops owl. If I could be in two places at once I would have joined him, but I enjoyed missing this outing to stay in and work on my blog. In the middle of the night, I woke up after being attacked by the local critters. I had forgotten that insects love me and I was walking around with bare legs and no bug repellant. Insects like to eat me. Somehow, I can be with a crowd of people, and no one else would be attacked by insects, except me. No more going ‘au naturel’ for me. I have committed to my new best traveling partner, Ben. He and I have a lot of traveling to do together. There are a lot of parks, and trails, and natural areas to explore and I made a promise to him that I won't forget to bring him along. Ben, I won’t wander without your wipes.